The Ekurhuleni Metropolitan Municipality has an incredibly high number of applicants for cultural and religious sites, competing for the scarce suitable land. Thus, a study was necessary to investigate the feasibility of developing a single precinct approach to satisfy these needs. 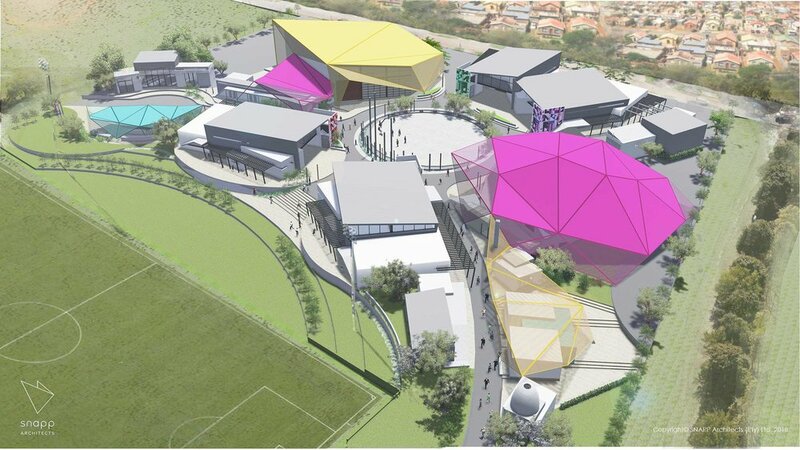 The Precinct in Vosloorus will be the pilot development and could potentially be adapted to other contexts and areas. This would provide a number of non-denominational, flexible spaces of varying scales to accommodate a wide range of applicants. The vision was to allow different congregations and associations to lease space at different times, which would enable the council to best manage all the different requests for facilities. The result was a proposal for a precinct of multipurpose halls, gathering spaces and educational facilities. The vision was to create a landmark in the community which would satisfy the cultural and worship needs of the greater urban area. Architecturally, the design lets the existing pedestrian routes across the greenfield site define the forms and placements of the buildings. In this way the predominant routes currently used by the community are formalized and enhanced by the dynamic forms of the buildings generated. Here people and community come first and the building plays the role of architectural mosaic, to the traditional pathways. This layout relies on a nodal arrangement in response, connected by organic corridors which provide a space for groups of all sizes to congregate both before and after functions. The development also took into consideration the need to provide for expansion, possible private sector participation, improvement of the socio-economic status of the community, be self-sustainable, be able to accommodate multiple functions simultaneously, form a prototype that can be re-deployed in other areas, to be accessible and safe, both day and night, three hundred and sixty-five days in the year.